The first feminist film ever to be made, La Souriante Madame Beudet (The Smiling Madame Beudet), offers a lot of inspiration for those who want to portray the ‘interior’ lives of women. 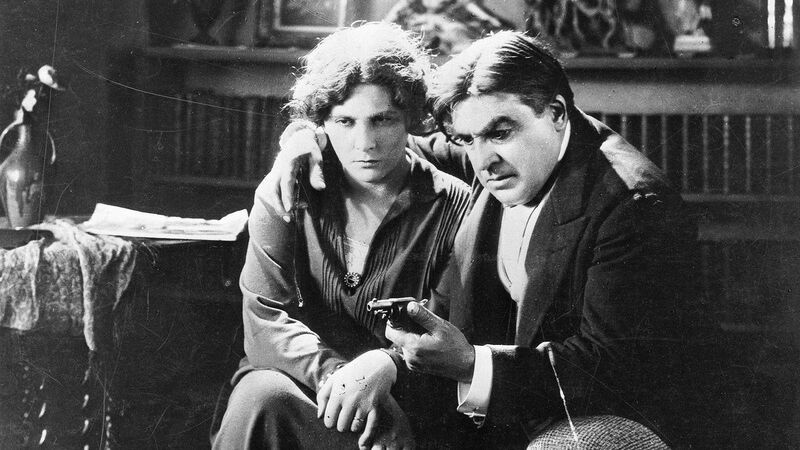 The 1923 short film was made by the impressionist auteur, Germaine Dulac. A feminist, who wrote in magazines before she became interested in films, Dulac made The Smiling Madame Beudet (played by Gemaine Dermoz) based on a story by Guy de Maupassant. The 38-minute silent film is available on Youtube with English subtitles. To begin with, what is really fascinating about this film is that it’s simply, unabashedly about the woman and what is going on in her head. The film is told through the eyes of Madame Beudet, who is hardly able to smile in the film, by the way. She’s married to a boorish merchant, who is highly controlling. She seems to be suffocated, both in the marriage and in the confines of her home. Dulac is playful with the imagery here. There is superimposition, dream sequences, play of mirrors, lights, and shadows… It’s intense and light by turns. When Beudet is reading a magazine, she imagines the young man with a tennis racket, posing in it, coming to life and hitting her husband on the head with it. Her husband wants her to come with him to a concert. She is just not interested. Her expression borders on disgust from boredom. At this point, he performs his usual gag. Her husband loves to joke that he’s going to shoot himself, whenever he’s unhappy with her. There is no bullet in that gun of course. Among Beudet’s visions and imagination, which are her escape from her intolerably, cruelly boring domestic life, is a court building too. Is it because she wants to separate from her husband or because she dreams of something more sinister? When her husband is at the concert, Beudet puts a bullet in the gun. The image of her husband pointing it to his head and laughing, of him moving her vase of flowers, away from where she wants it, of him asking her to help wear the tie, haunt her. She wakes up the next day and is further haunted by more images. This day she’s really nervous and wants to take the bullet out of the gun before he finds out. But she hardly has any privacy. There is someone or the other constantly walking into her room. Finally, the gun with the bullet in it goes off, earning Chekhov’s approval. It doesn’t hit anyone. It hits a different vase. And yet, the ending isn’t sweet. It doesn’t make Madame Beudet happy. You can taste the discontent in her mouth leaping off the screen. A woman who is vexed and dreams of leaving the prison of domestic life may seem outdated and even not-so-feminist now. But this film continues to be relevant, not simply because its gaze dares to showcase female displeasure, but also because it’s very ‘indulgences’ are political. That a film like this exists, in which the director indulges with shots that serve no other purpose than to showcase the mindscape of its leading woman, that there’s a leading woman who simply does not ‘please’ anyone on screen, who’s tired, is all political, is it not? There is surely a lesson in here for all of us looking for better portrayal of women on screen.